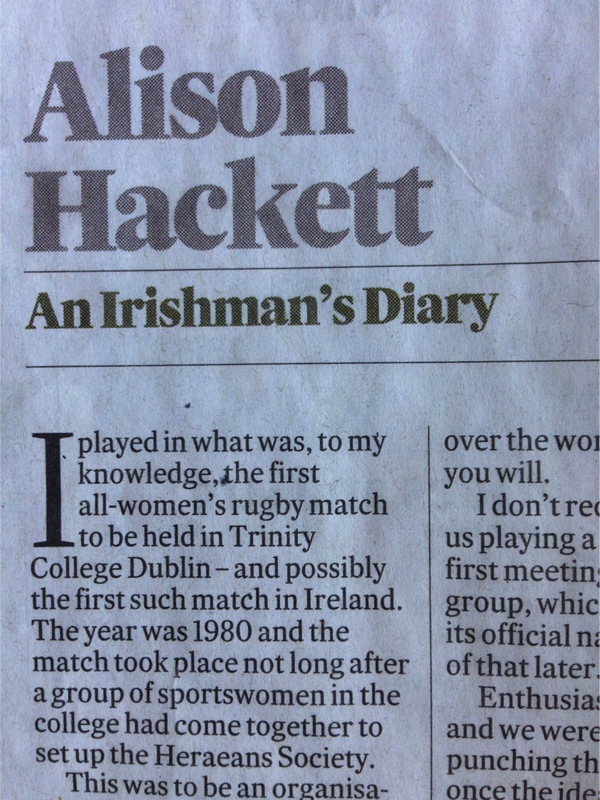 "I played in what was, to my knowledge, the first all-women’s rugby match to be held in Trinity College Dublin – and possibly the first such match in Ireland. The year was 1980 and the match took place not long after a group of sportswomen in the college had come together to set up the Heraeans Society. This was to be an organisation that would honour women in their sporting achievements, or as we saw it, act as an important counterpoint to the Knights of the Campanile, which was then an exclusively male club (“a fraternal sporting organisation with a membership of over 700 from all over the world”. A fraternity, if you will. I don’t recall any vote about us playing a rugby match at the first meeting of the women’s group, which still didn’t have its official name yet, but more of that later......"